One specific node is fixed as the starting point of finding the subgraph using Prim's Algorithm. Find the total weight or the sum of all edges in the subgraph. For example, consider a graph with nodes. Possible edges are weight , weight and weight . Starting from node , we select the lower weight path, i.e. , weight . From node , there is only one path left, weight . We have all nodes connected at a cost of . Complete the prims function in the editor below. 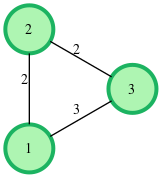 It should return and integer that represents the minimum weight to connect all nodes in the graph provided. 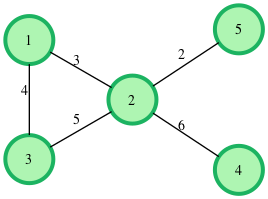 The first line has two space-separated integers and , the number of nodes and edges in the graph. Each of the next lines contains three space-separated integers , and , the end nodes of , and the edge's weight. There may be multiple edges between two nodes. Print a single integer denoting the total weight of the subgraph. (WT. 3) and (WT. 4) , out of which is chosen (smaller weight of edge). (WT. 4) , (WT. 5) , (WT. 2) and (WT. 6) , out of which is chosen by the algorithm.